The following refers to reels with Instant Anti-Reverse. Links to pages describing strip-downs for home servicing can be found here. If the release button has to be pulled out to engage the gears the spring (22804) is broken, but if the reel can be put in gear by turning the handle sharply the spring might just be on its last legs - more likely the spool release lever (21432) is worn. In worst case scenarios the cog on the main drive shaft (22081) can also be worn. Remove left side plate and check these components. Fit a new spring no matter what. Inspect the lever for wear at its tip - if it is grooved replace it. Check the main cog which the lever acts on for wear and replace if worn - this part seems to wear less than the lever. NB -The release return spring has been beefed up, and a different part number has been assigned. The last time I ordered some I was quoted one part number for this spring, but the number written on the bag they came in was different. Best to check before ordering! Update - Latest models have the redesigned release mechanism first used on RHW models (schematic). The return spring has been done away with as it is now part of a new pinion lifter retainer (25994) and the release lever is a new shape and incompatible with older models. 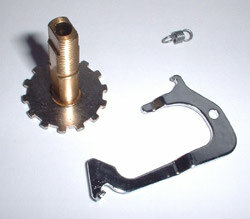 The same principles of wear apply to the system, but should the spring fail you will have to replace the pinion lifter. Lack of lubrication is the cause of casting noise. A quick, but temporary, fix can usually be achieved by dunking the reel in the water! This will do the reel no good in the long run - and is definitely not recommended for saltwater anglers. The reel should be stripped, dried and relubricated on returning home after this barbaric treatment. If you carry oil with you treat the levelwind worm gear and spool bearings. To access the spool bearings when fishing remove the left hand side plate and pull the spool out. Take care when replacing the spool to ensure brake blocks are pushed fully in before replacing the side plate. If the reel still squeals after lubrication, replace the bearings. If the levelwind still misbehaves a new worm gear might be required, or there could be dirt clogging the levelwind. Remove pawl as described above, and take off right hand side plate. Push forward retaining plate (5178) under the exposed brass levelwind cog. Pull out worm gear by the cog. Clean inside the worm gear shroud, and clean the worm itself. Refit, oil and test - not forgetting to replace the pawl. Do not grease the levelwind mechanism unless you want to drastically cut your casting distance - use only oil. If still no joy fit new worm gear. Might as well make it a dual bearing one while you're at it! Odds on there is some sand or grit in the levelwind. The 'dunking' trick should clear that, and a drop of oil on the levelwind worm will smooth things out for the rest of the day. If using braid on the reel check that the line isn't slipping around the spool. If it is, strip the line from the spool and either tape the first few yards to the spool with masking tape, or add a layer of nylon as backing before respooling the braid. If drag still slips then replace the concave/convex washers (5131). Long-term tightening of the drag can squash these washers and adversely affect the performance of the drag. An emergency repair can be effected by bending the washers to give more curve and refitting them. This can be an intermittent problem, or permanent. If it is intermittent strip the left hand side plate and remove it exposing the anti-reverse bearing that the main handle drive shaft runs through. Clean the bearing and re-oil it. If the problem persists a new bearing is required - which means a whole new side plate as the bearing is not removable. Not a major problem, but annoying. Power handles are particularly prone to squeaking when ageing. Lubricate the inside of the handle knob. I guess oil or grease is best, but saliva seems to do a good job when applied once or twice a day! Persistent squeaks suggest it is time for a new handle. The soft touch flat handle grips shouldn't squeak as they have a central plastic sleeve, but the grips themselves have been known to pull off some models of this handle when you strike! Firstly, when using braided line, check that the line is not slipping around the spool. If it is strip the line off and secure the first couple of turns with a wrap of insulation or masking tape. If the line is not slipping make sure that the drag is tightened sufficiently, if it is check for contamination on the drag washers. If the drag is not the cause and the spool still slips possibly with a juddering feeling as it does and perhaps accompanied by a grating sound, then it is likely a case of worn gears. Close inspection of the pinion and drive gears is required as there may only be localised wear causing the gears to fail to mesh intermittently as the worn sections on each gear meet. It is wise to replace both gears.